PRERA will be holding its annual general meeting (AGM) on 2nd April 2019. 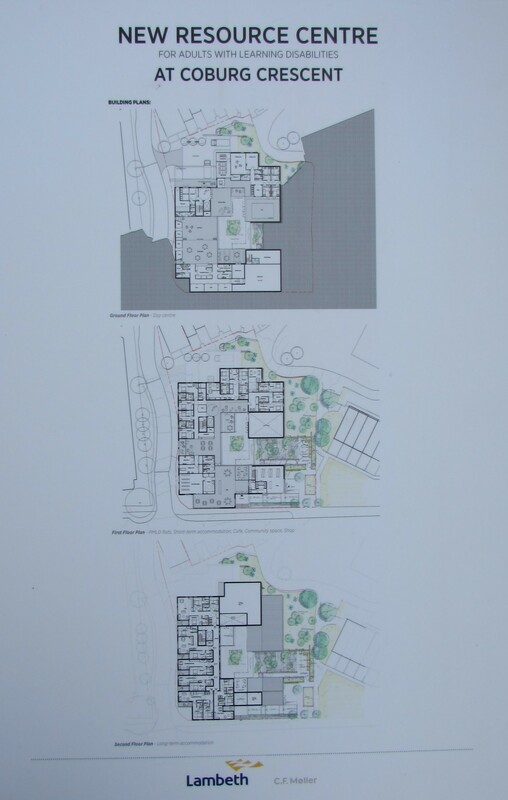 The main purpose of the meeting is to ensure the continued existence of our residents’ association. 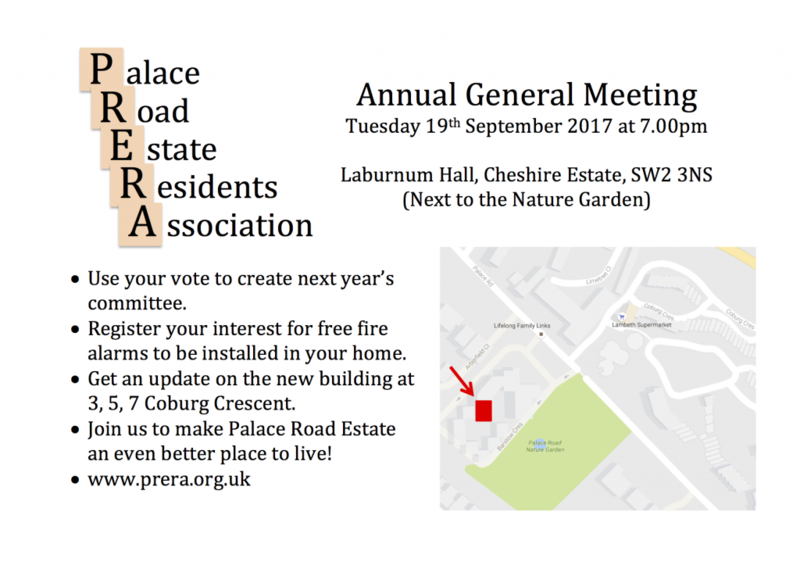 We need enough people to attend so that we can elect a new committee for the coming year and continue to make Palace Road Estate a great place to live. Please come to the meeting and share your views, hear more about the association and get involved. The meeting starts at 7.30pm, but refreshments will be served from 7.10pm. 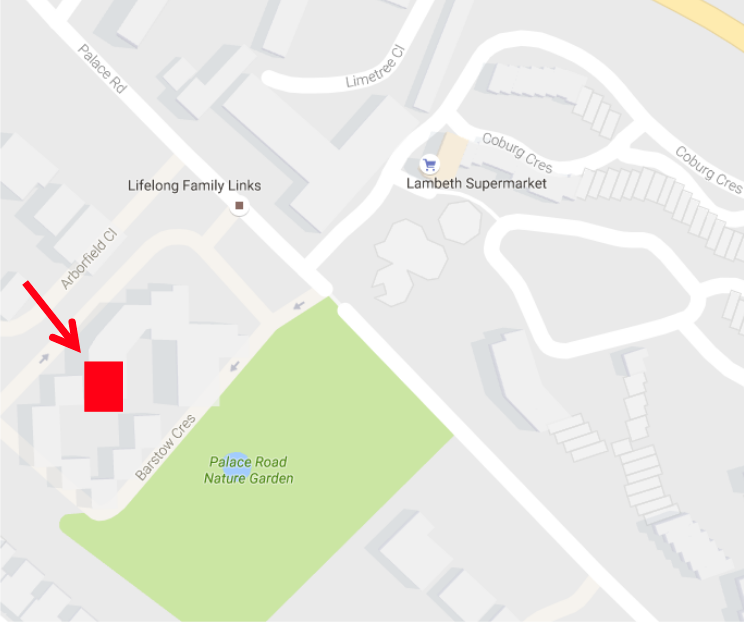 As in previous years, the meeting will be held at Laburnum Hall, which is on the Cheshire Estate, next to Palace Road Nature Garden. Only 15 households were represented at the AGM on 16th October – short of the minimum 17 required to hold an election for a new committee. So the AGM was held without a new committee being elected. The previous committee can carry on serving for a few months, but after that the association will be disolved, unless a new election can be held. If PRERA ceases to exist, the voice of the residents will be weaker when dealing with the council or the council’s contractors. Good representation for residents will be increasingly important over the coming years as the council plans to spend millions of pounds carrying out much-needed major maintenance work. Would you like the work of PRERA to continue? 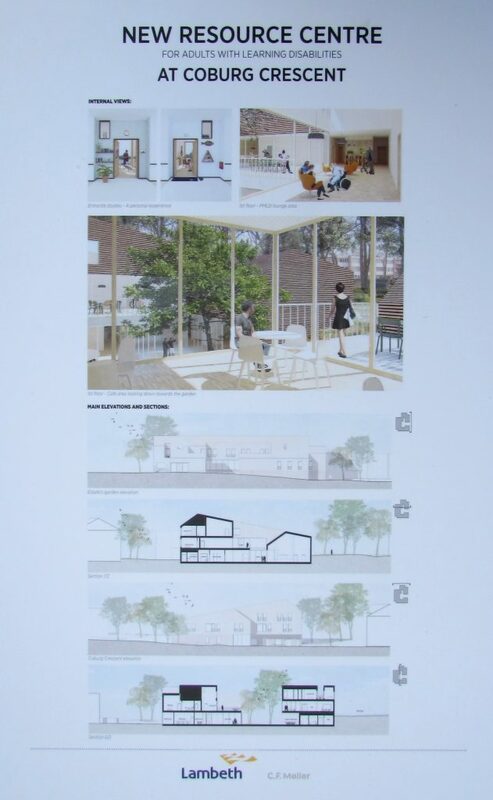 Can you help to make this happen? Do get in touch. 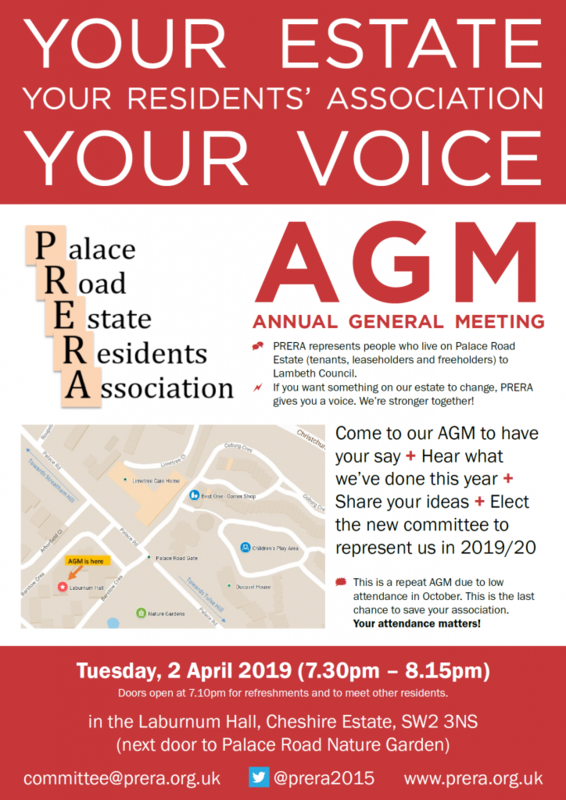 PRERA’s AGM for 2018 will be held at 7pm on 16th October. 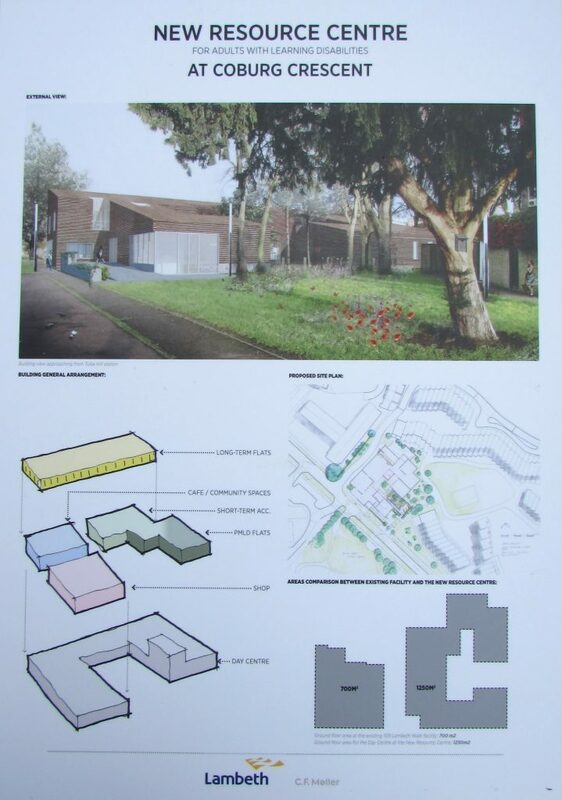 As in previous years, the venue will be Laburnum Hall on Cheshire Estate – just next to the Palace Road Nature Garden. The committee will give a review of what has happened over the past year. There will then be an opportunity to vote for, or be elected to, next year’s committee. A council officer will also be present to give an update on a proposed new waste policy. If you care how the estate is maintained, if you want to help organise events, or if you want to influence how your council tax or service charges are spent, come along! PRERA’s AGM will be held on 19th September 2017 at 7pm in Laburnum Hall on the Cheshire Estate. This is an opportunity to hear about what your committee has done on your behalf over the last year and to elect a new committee for next year. If you would like to get more involved with our estate community, please get in touch. Whatever you are interested in, be it youth activities, gardening, community engagement or something else entirely, PRERA can help you. Thank you to everyone who came along to PRERA’s first open-air general meeting earlier today. We hoped for warm sun, but came prepared for rain. In the end, we had both, but our gazebo served us well and no-one got too wet. 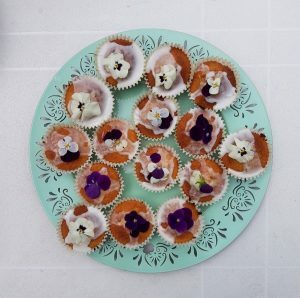 Those residents who came were treated to Franny’s beautiful cupcakes, free pens and key-rings (thank you Gerry) and impromtu exercise sessions on the gym equipment. 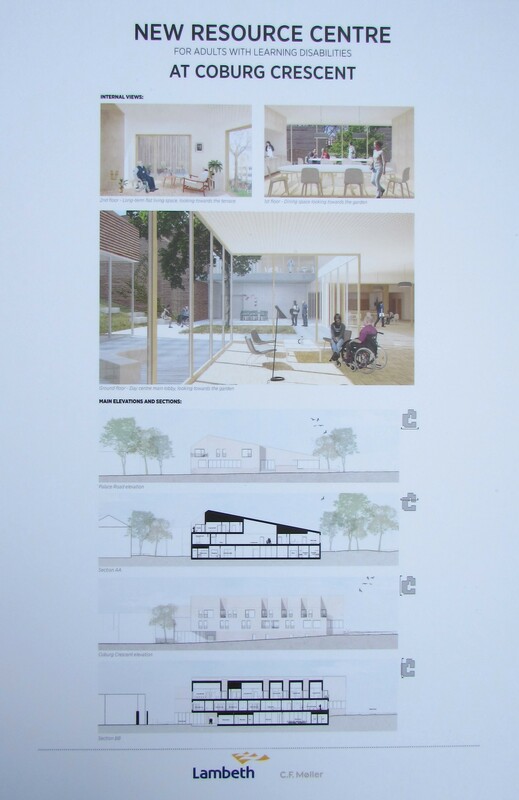 PRERA had produced a display to illustrate what they have been doing this year and, next-door, Gerry Evans from the council presented drawings of the planned resource centre for adults with learning disabilities. Residents raised their concerns about refuse, out-of-control dogs, a lack of seating, noisy neightbours and shortcomings in maintenance. 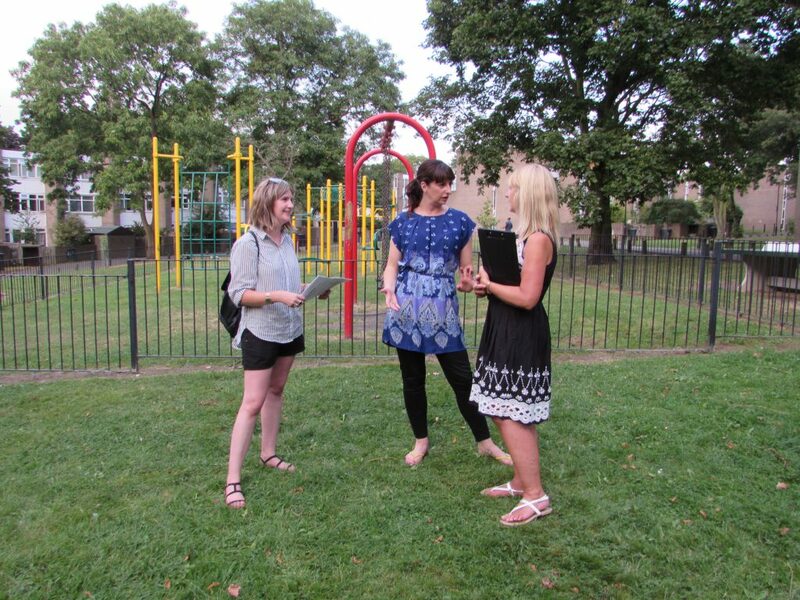 On the plus side, people shared their satisfaction with the recent improvements to the play area and their appreciation that they live in such a green and, on the whole, quiet area. PRERA will be holding a general meeting on 20th May between 1pm and 3pm. This will be an open-air meeting, held on the grass next to the play area. Every resident is invited, so please drop by at any time. This is an informal meeting, but there will be seating available for those who need it. 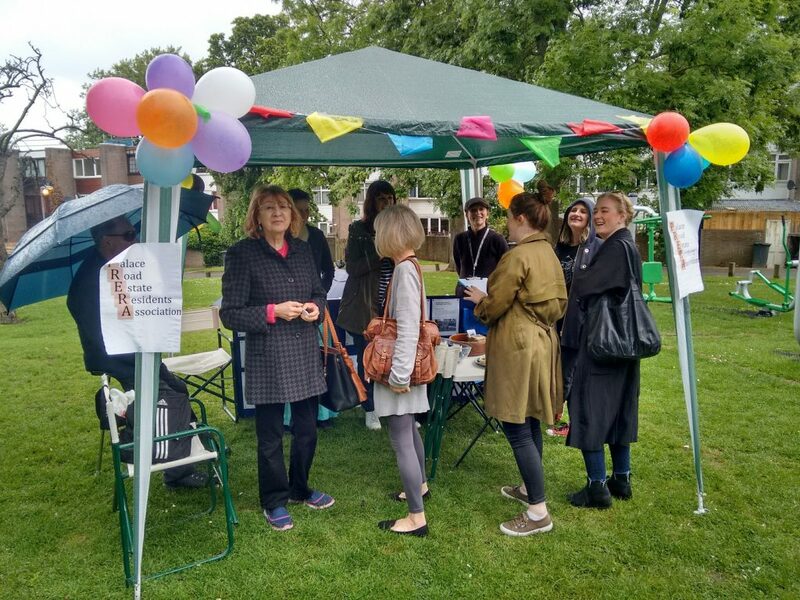 You can meet members of the committee and learn about what your residents’ association has been doing for you. You can also get involved by making suggestions for future activities or volunteering to help improve our estate.